All hell broke loose after Khabib Nurmagomedov submitted Conor McGregor in round four of the UFC 229 main event. “The Eagle” proceeded to jump over the cage and attack Conor McGregor’s good friend and training partner Dillon Dalis. Round one begins and Conor immediately takes the center of the octagon. He leaps in with a left hand that lands. A lot of pressure from Conor McGregor early. Khabib shoots for a takedown and gets an ankle pick. Conor McGregor is dragged down to the floor. He gets back up after scoring a switch. Khabib stays on him and quickly drags him back to the canvas. Khabib is looking to pass guard and Conor scrambles back up against the fence. The Irishman is trying to wall-walk but Numragomedov will not let him. Khabib with a couple of right hands now. Another big right from Khabib with Conor pressed against the fence. “The Eagle” is looking to move to mount now. Conor scrambles and avoids giving up the position. Khabib regains top control and passes to half guard. He begins dropping down left hands. Conor is pinned but is throwing open palm strikes from his back. More lefts now from Khabib. He drops down a big right just as the horn sounds to end round one. Round two begins and Conor McGregor immediately presses forward. Khabib circles along the fence. McGregor fires off a knee. Khabib responds with a right hand that drops McGregor. The Irishman pops right back up to his feet but Khabib leaps at him with a flying knee. Khabib with punches and now a takedown. McGregor is in trouble here. “The Eagle” moves to mount but “Mystic Mac” quickly scrambles back to full guard. Khabib with some serious ground and pound now. He lands a big right hand. Conor McGregor is talking to him, but the undefeated Russian just continues to land punches. Khabib is mauling him now. Huge shots from the top. Khabib is delivering bombs. Two minutes remain. Khabib with more shots. He moves to side control and begins looking for a kimura. McGregor breaks free and attempts to scramble back to his feet. He does and the crowd goes wild. Khabib keeps Conor pressed against the cage and the horn sounds to end round two. Round three begins and McGregor throws a front kick. he follows that up with a left hand and then another. Conor goes to the body with a jab. Khabib circles along the fence and then leaps in with a left jab. McGregor continues to press forward. Nurmagomedov comes forward with a combination. He shoots in for a takedown and Conor McGregor stuffs it. Khabib gets up and lands a big right hand. He once again shoots in for a takedown but again it is not there. This is great news for Conor McGregor fans. The Irishamn fires off a left hand and then an uppercut. The crowd is going wild. “Mystic Mac” continues to press forward with punches. Khabib slaps him and then points to his hand. This is crazy that Nurmagomedov is choosing to stand in front of Conor. Khabib goes to the body with a punch and then presses Conor up against the cage. He scores a trip but Conor gets right back up. 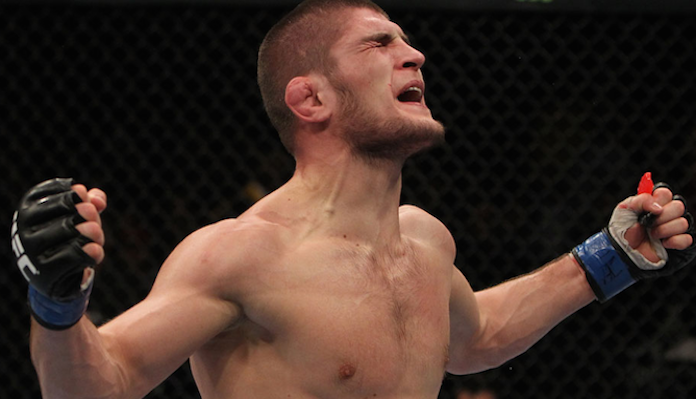 Nurmagomedov has him pressed against the cage and the fighters begin trading knees. Khabib complains that Conor is grabbing his gloves. Round three comes to an end.